Dan Phung ’15 spent three weeks of his winter break on an isolated island in Panama, where he explored the rain forest in the morning, snorkeled to see coral reefs in the afternoon, and stargazed with his feet in tropical waters at night. Phung went to Panama to take courses in tropical rain forest and canopy ecology from the Institute for Tropical Ecology and Conservation (ITEC), a non-profit, education, research and conservation organization operating the Bocas del Toro Biological Station in Panama. He paid for the program with a grant from the Randolph Innovative Student Experience (RISE) program. 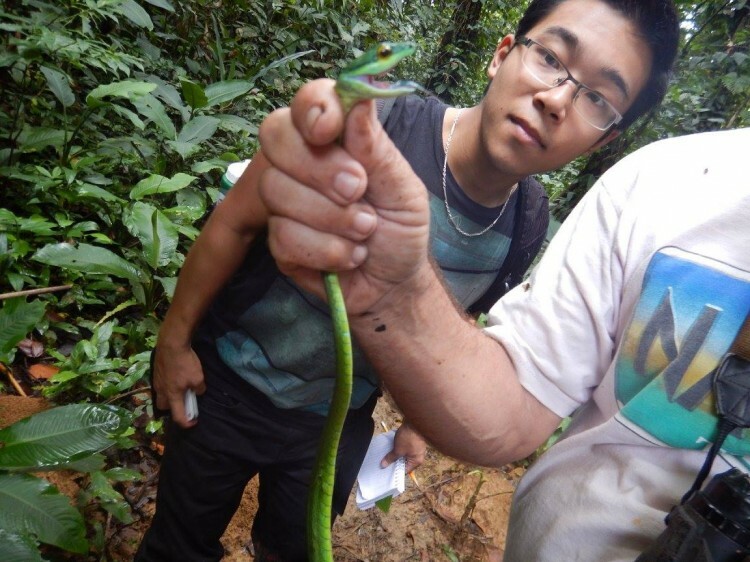 As part of the course, Phung and six other students venture deep into the rain forest to study the biodiversity there with two ITEC professors, who gave them informal lectures about their surroundings along the way. They took note of various animals they saw, including snakes, three-toed sloths, and spiders. “The biggest one was about the size of my palm,” said Phung. Although he was there to learn about biodiversity and ecology, Phung also learned a lot about climbing trees—to reach one research platform, he had to climb about 150 feet using a single rope. “The animals living up there are also very special. I saw a Capuchin monkey for two or three seconds as it was moving between branches,” Phung said.